Free admission! Lunch will be served. LGBT Business Enterprise (LGBTBE) Certification from the NGLCC can be one of the most valuable tools any LGBT business owner can possess. In addition to opening up contracting oppporutnites across the Fortune 500, it can also be a gateway to government contracts, business development grants/loans, mentorship, and much more. Learn about the certification process, its countless benefits, and how to take your business to the next level with NGLCC’s network of LGBT chambers and partner organizations around the world. 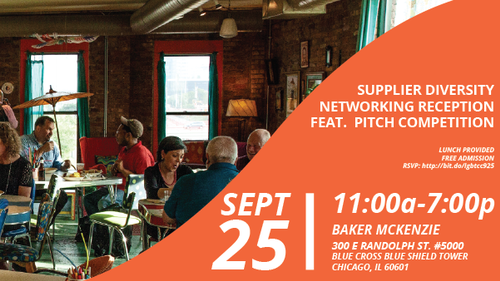 5:00-7:00 - Networking and pitch competition! * Corporate companies that are interested in participating in this one-on-one opportunity must contact admin@lgbtcc.com to register for the event. Lunch will be served. Reception will include food and spirits.